Scenic Hudson has protected 1,600 acres contributing to panoramic vistas from the home of renowned 19th-century painter Frederic Church. 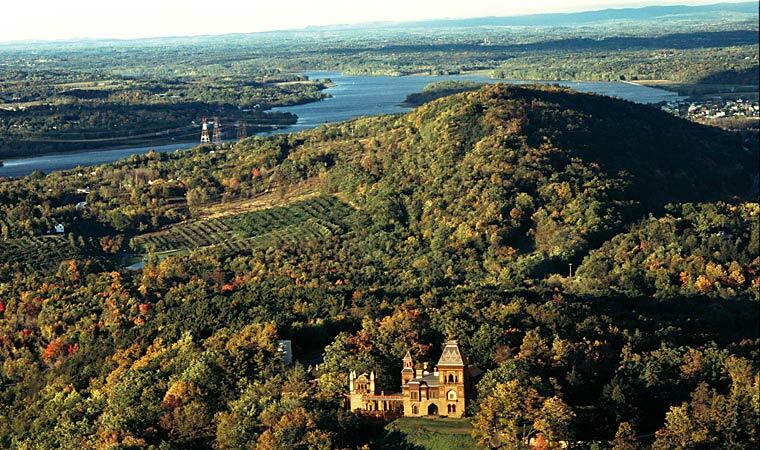 HUDSON, Columbia County—Scenic Hudson has conserved more than 2,000 acres of forests and farm fields surrounding Olana, hilltop home of renowned 19th-century landscape painter Frederic Church, preserving views he and other Hudson River School artists immortalized on canvas. Today Olana State Historic Site is owned by the NYS Office of Parks, Recreation and Historic Preservation and is one of the Hudson Valley's most important and impressive tourist destinations. For more information visit olana.org or call 518-828-0135. Olana State Historic Site features 5 miles of hiking trails and carriage roads. One mile south of Rip Van Winkle bridge.